Inspired by food. Dry cured by hand and air dried on our family farm. British charcuterie. 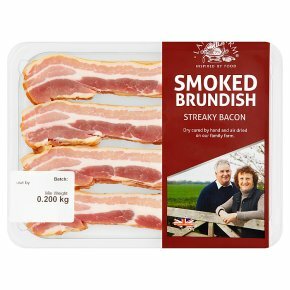 We hand cure this award winning bacon on our Suffolk farm using our own pork which has been outdoor bread & finished in open straw barns. It is cured in a traditional way by rubbing pork bellies with sea salt & demerara sugar. It is cured for two weeks, then smoked over Oak & Beech chippings before being hung to dry to let the flavour mature.